“Our Little Sister” (Original title: “Umimachi Diary”) (2015 production, 2016 release). Cast: Haruka Ayase, Masami Nagasawa, Kaho, Suzu Hirosu, Shinobu Otake, Kirin Kiki, Shinichi Tsutsumi, Jun Fubuki, Takafumi Ikeda, Oshiro Maeda, Ryô Kase, Lily Franky, Yuko Nakamura, Kentaro Sakahuchi, Midoriko Kimura. Director: Hirokazu Kore-eda. Screenplay: Hirokazu Kore-eda. Graphic Novel: Akimi Yoshida, Umimachi Diary. Web site. Trailer. How we define “family” need not follow traditional interpretations. Indeed, it can take a variety of inventive and novel forms, often working exceedingly well in meeting everyone’s needs. Such is the case in the heartwarming new family drama from Japan, “Our Little Sister” (originally titled “Umimachi Diary”). Based on a popular Japanese graphic novel, the film tells the story of three sisters in their 20s, Sachi (Haruka Ayase), Yoshino (Masami Nagasawa) and Chika (Kaho), who share a home that has been in their family for generations in the seaside city of Kamakura. The Kôda siblings have been on their own for quite some time, their father having abandoned them for another woman and their mother (Shinobu Otake) having left not long thereafter under somewhat unspecified circumstances. But they manage well, self-sufficient and reasonably comfortable. When word reaches the women of their estranged father’s passing, they also learn of a previously unknown teenage half-sister, Suzu Asano (Suzu Hirosu). Upon attending the funeral and discovering that Suzu essentially has no one to care for her (her own mother having previously died and her selfish widowed stepmother (Yuko Nakamura), their father’s third wife, showing no interest in the idea), the Kôda sisters invite their newfound sibling to come live with them, an offer she readily accepts. Before long, the family home in Kamakura has a vibrant new resident, one whom the elder sisters adore. The Kôda sisters, Sachi (Haruka Ayase, far left), Yoshino (Masami Nagasawa, far right) and Chika (Kaho, second from right), welcome their previously unknown half-sister, Suzu (Suzu Hirosu, second from left), into their home in the new family drama, “Our Little Sister.” Photo by Akimi Yoshida, Shogakukan, Fuji Television Network Inc., Shogakukan Inc., courtesy of Sony Pictures Classics. This scenario thus sets the stage for a family coping with loss and change in a variety of forms. But, no matter what challenges arise, the four sisters have one another for support, guidance and encouragement. This arrangement may not follow the normal conventions of family life, but they make it work in their own way, with joy, love and hope for the future. This alternative arrangement shows us what’s possible when we push through limitations, a chief aim of the conscious creation process, the means by which we manifest the reality we experience through our thoughts, beliefs and intents. Since this philosophy enables the materialization of any possibility, that includes options previously untried and those that defy conventional thinking. It’s also applicable in virtually any context, an important consideration these days for those seeking different approaches to making sure family needs are properly met. What’s more, the meaning of family for these siblings extends beyond the immediate family unit and even blood relatives. Again, embracing such an expanded definition of the concept comes down to our beliefs and what they enable. For instance, when the girls’ mother leaves and their grandparents die, their auntie, Fumiyo (Kirin Kiki), steps up to assist. The same is true of a kindly café owner, Sachiko Ninomiya (Jun Fubuki), who becomes a sort of surrogate mother to the sisters in their parents’ absence. These circumstances may be far from conventional, especially in such a traditional culture as Japan, but, if they work, why should the result be questioned? Newly arrived member of the Kôda family, Suzu (Suzu Hirosu, right), gets pampered by her older half-sister, Yoshino (Masami Nagasawa, left), in director Hirokazu Kore-eda’s new family drama, “Our Little Sister.” Photo by Akimi Yoshida, Shogakukan, Fuji Television Network Inc., Shogakukan Inc., courtesy of Sony Pictures Classics. How such arrangements arise and are subsequently viewed is also governed by our beliefs. For example, it might be easy for the Kôda sisters to be embittered toward their father. Few would likely fault them for believing that his infidelity and abandonment ruined their family and undoubtedly contributed to their mother’s departure. However, it’s also possible to flip those beliefs, as Sachi does when she observes that their father may have been a kind man after all for having given her and her siblings such a lovely little sister. By drawing Suzu into their lives, Sachi, Yoshino and Chika have an opportunity to forgive their father (and, potentially, their mother), to help them heal and to infuse some unexpected joy into their lives. And, by drawing her half-sisters into her life, Suzu has a shot at a new beginning, a family unlike anything she’s ever experienced, and a chance to rid herself of an erroneous, self-imposed belief that her existence is the innate cause of others’ unhappiness. The result in all this is a win-win situation for everyone, the best of all possible conscious creation outcomes. It’s presented so convincingly here that viewers are able to feel the love and warmth among the protagonists, an accomplishment not always easy to achieve cinematically. 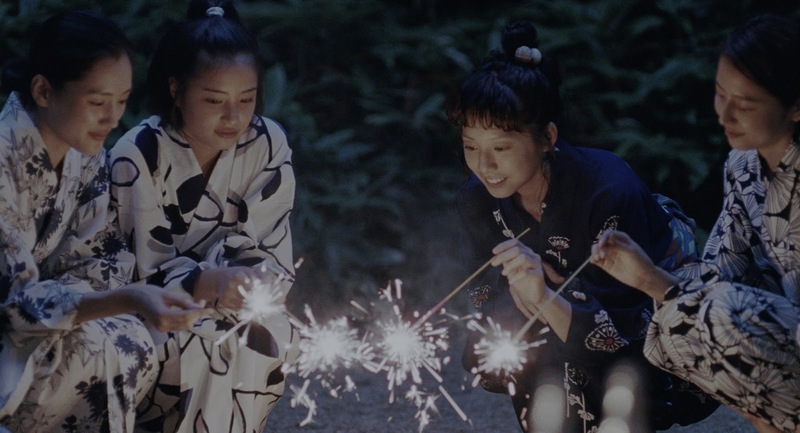 As a breezy, pleasant slice of life, “Our Little Sister” delivers many warm fuzzy moments, punctuated by gorgeous cinematography, fine performances and a palpable chemistry among the siblings. And, for its efforts, the picture earned a Palme d’Or nomination at the 2015 Cannes Film Festival, the event’s top award. Unfortunately, despite this honor, the film’s narrative at times is a little lightweight, keeping the story (and the picture) from living up to its full potential, resulting in an occasionally unsatisfying (and somewhat overlong) offering. That’s regrettable, given the talent of a director like Hirokazu Kore-eda, who’s shown through previous releases that he’s capable of better and more substantial work. 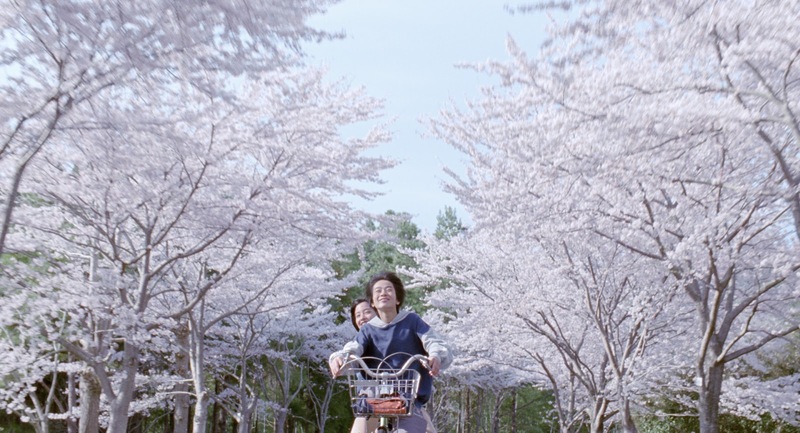 A bike ride through the cherry blossoms with a friend (Oshiro Maeda, foreground) brings joy to Suzu Asano (Suzu Hirosu, background) in the new family drama, “Our Little Sister.” Photo by Akimi Yoshida, Shogakukan, Fuji Television Network Inc., Shogakukan Inc., courtesy of Sony Pictures Classics. Still, despite its shortcomings, “Our Little Sister” definitely has its heart in the right place. Its warmth and goodwill, as well as its unapologetic approach to celebrating the unconventional, are undeniable, inspiring those looking for viable alternatives to traditional family life, especially for tackling life’s thorny domestic challenges. These sisters clearly do it for themselves – and quite well at that. In an age of shifting attitudes and outlooks, it’s refreshing to see a film that zealously celebrates these alternatives. The family unit may not be what it once was, but that doesn’t mean it can’t deliver the same qualities as its more traditional predecessor. With imagination and the courage to explore the creation of such options, many fulfilling possibilities can be brought into being – and beautifully at that.